From August 23 to November 18, NIU Museum Rotunda Gallery hosted the exhibit “From Tradition to Modernity: Art from Myanmar as Viewed by Contemporary Burmese Artists”. 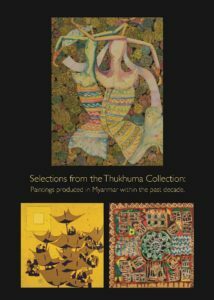 In parallel from September 1 to October 27, NIU’s Olson Gallery hosted the exhibit “Painting Myanmar Today: A Selection from the Thukhuma Collection”. These exhibitions were offered in conjunction with the International Burma Studies Conference at NIU, October 6-9, 2016, and were part of “Kaleidoscope of Burmese Art”, celebrating the 30th Anniversary of the Center for Burma Studies. Support came from The Elizabeth Allen Visiting Scholars in Art History Fund, the Art History Division at NIU, the Visiting Artist and Scholar Fund of the School of Art and Design, the Friends of the NIU Art Museum, the Dean’s Circle of the College of Visual and Performing Arts, the Olson Gallery, NIU Art Museum, the Center for Southeast Asian Studies and the Center for Burma Studies.